Two prior cohort studies suggested that choline, but not betaine intake, is associated with an increased risk of advanced prostate cancer (PCa). Given that evidence remains limited, we evaluated whether intakes of choline and derivative betaine are associated with total and lethal PCa risk and PCa death in men with PCa. We included 6,528 men (24.4% African American) without a cancer diagnosis at baseline (1987–1989) followed through 2012. Dietary intake was assessed using a food frequency questionnaire coupled with a nutrient database. We used Cox proportional hazards regression to estimate hazards ratios (HRs) and 95% confidence intervals (CIs) of total and lethal PCa risk overall and by race. Choline intake was not associated with total (n = 811) or lethal (n = 95) PCa risk overall or by race. Betaine intake was inversely associated with lethal (tertile 3 vs 1, HR 0.59, 95% CI 0.35–1.00, p trend = 0.04), but not total PCa risk; patterns for lethal PCa were similar by race. 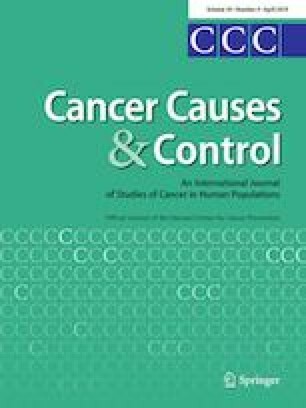 Neither nutrient was associated with PCa death in men with PCa. Choline intake was not associated with total or lethal PCa or with PCa death in men with PCa. Betaine intake was inversely associated with lethal, but not total PCa risk or with PCa death in men with PCa. Our results do not support the hypothesis that higher choline intake increases lethal PCa risk, but do suggest that higher betaine intake may be associated with lower lethal PCa risk. Further investigation with a larger number of lethal cases is needed. The online version of this article ( https://doi.org/10.1007/s10552-019-01148-4) contains supplementary material, which is available to authorized users. The authors thank the staff and participants of the ARIC study for their important contributions. Cancer incidence data have been provided by the Maryland Cancer Registry, Center for Cancer Surveillance and Control, Maryland Department of Health, 201W. Preston Street, Room 400, Baltimore, MD 21201. We acknowledge the State of Maryland, the Maryland Cigarette Restitution Fund, and the National Program of Cancer Registries (NPCR) of the Centers for Disease Control and Prevention (CDC) for the funds that helped support the availability of the cancer registry data. The Atherosclerosis Risk in Communities study has been funded in whole or in part with Federal funds from the National Heart, Lung, and Blood Institute, National Institutes of Health, Department of Health and Human Services, under Contract Nos. (HHSN268201700001I, HHSN268201700003I, HHSN268201700005I, HHSN268201700004I, HHSN268201700002I). Studies on cancer in ARIC are also supported by the National Cancer Institute (U01 CA164975). This work was additionally supported by P30 CA006973 and P30 DK056350. CE Joshu received support from the Prostate Cancer Foundation. The content of this work is solely the responsibility of the authors and does not necessarily represent the official views of the National Institutes of Health.